For the last couple of years, Hollywood has made use of the trope along the lines of “old people being out of touch with young people until they’re brought together in some way.” The problem is that so far none of the screen efforts have actually been very good. Two years ago, The Internship flopped quickly; last year, While We’re Young was disappointing structure wise; and now Nancy Meyers’ new movie, The Intern, is not only uninspired but also a little boring. 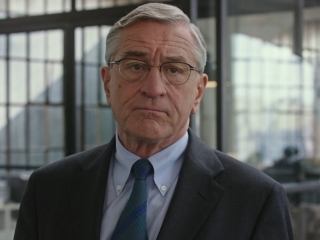 After his wife dies and he’s already settled into retirement, Ben Whittaker (Robert De Niro) answers an ad looking for “senior interns” with experience. He lands a position as the assistant to Jules Ostin (Anne Hathaway), the head of a hit fashion website. Jules is a workaholic and perfectionist who is attached to her iPhone and laptop, while Ben still uses a briefcase and physical notebook. Ben helps the self-conscious Jules welcome a new CEO who is coming in to monitor the company. Rene Russo co-stars as Ben’s love interest and Anders Holm plays Jules’ husband. Hathaway’s charm is perfect for a Meyers movie making it surprising The Intern is their first collaboration. De Niro has shown over the years that he has both good dramatic and comedic timing, but unfortunately here he looks either passive or bored throughout the movie. Meyers’ dialogue comes off like phony commercial lines at times. Like the last two ineffectual seniors-meet-twenty-somethings films, The Intern relies too much on technology gimmicks and not enough on character interaction.